What if your car was like an app, and it automatically updated while you were sleeping? Tesla's vehicles already do exactly this. You don't always need to take your car to the shop, or lay any hands on your car at all for that matter, to upgrade it. That is, if you own a Tesla (NASDAQ:TSLA) Model S. Not only can the company upgrade your software over the air, but it can also upgrade the physical abilities of your car. 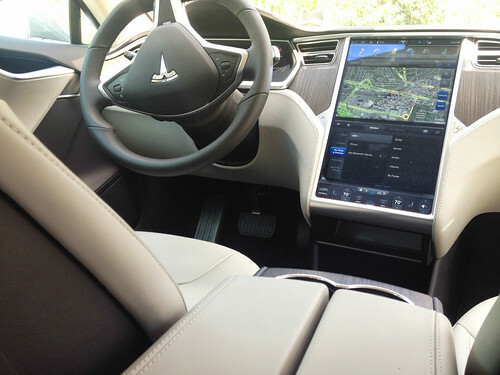 Model S 17-inch touch screen panel, where owners are notified of over-the-air updates. [W]e have rolled out an over-the-air update to the air suspension that will result in greater ground clearance at highway speeds. To be clear, this is about reducing the chances of underbody impact damage, not improving safety. The theoretical probability of a fire injury is already vanishingly small and the actual number to date is zero. Another software update expected in January will give the driver direct control of the air suspension ride height transitions. The update will enable vehicles with the Smart Air Suspension package to automatically adjust the suspension to higher levels at highway speed. If you've never experienced auto service like this, you're not alone. Tesla was the pioneer in over-the-air updates for vehicles. Confirmed in October by Tesla spokeswoman Elizabeth Jarvis-Sean, all Model S vehicles come equipped with AT&T network chips, making over-the-air updates possible. Of course this comes with a number of other perks, including free Internet browsing, navigation, and streaming music. Tesla doesn't charge Model S owners for this Internet. Over-the-air updates for vehicles are the future, according to Wired journalist Damon Lavrinc. Though it may be already reality for Model S owners, Lavrinc last year predicted that "in the future, your automobile will be locked in the same cycle of never-ending software upgrades that holds sway over computers and smartphones." The benefits are irrefutable. Ultimately, over-the-air updates lead to a car that is capable of becoming smarter and more effective over time. "Think of Model S as an app on four wheels," says the company's website. While some updates may only make minor improvements to software, others are more important. For instance, electric cars don't need to automatically creep forward when you let off the break pedal, but some Model S owners missed creeping forward. So Tesla simply rolled out an update to owners that allowed them to turn the creep function on or off from their 17-inch touch screen. There's no reason traditional vehicles couldn't have some form of over-the-air updates, too. But no other manufacturer got around to it before Tesla. The feature exemplifies management's clear effort in launching not just good electric cars, but the best cars ever. Though Tesla's valuation is tough to justify, its attention to details and its persistence to push the limits of innovation with the Model S provide a convincing case for a passionate leadership team that can continue to execute at levels that exceed our expectations. It's this same innovative spirit that lead to over-the-air updates that has helped the Model S receive an exhaustive list of impressive accolades in 2013, including the safest car ever tested in the U.S.